Time to talk: Have you ever recreated a childhood photo? Have you ever made your kids recreate a childhood photo? Would you, too, love a calendar of recreated photos from your children’s youth? Have you ever seen the pet food commercial where the big dogs all think they are small dogs? My daughter actually has a tiny dog that she carries around in a purse. Her dog, Snowflake, is a cutie-patootie and is super smart as well. However, that commercial reminds me of my cat, Dakota a/k/a Stewie. Though Stewie is the youngest of my brood, he is far from being the smallest. In fact, he weighs more than all but one of my five cat-kiddos. Even so, Stewie considers himself to be a petite man, and he likes to think he can hide anywhere. One of his favorite places to hide is in grocery bags. Or if we have visitors who carry large handbags, he will sneak into them as well. He doesn’t care that the bags don’t belong to his people. He makes himself right at home. Let’s talk: Do you prefer a large purse or a small handbag? Have you ever lost your pet in another person’s belongings? What would you do if you found someone else’s pet in your purse after you left their house? Remember back when I told you how I was writing, directing and producing some TV commercials for an attorney friend? Well, today and tomorrow, we’re filming six more commercials. All these commercials have a similar theme, and they start when he’s a child in the early 60s, and end in current times. They’re part of a series, and we’re trying to make people look forward to the next one. The best example of this I can think of is the Stove Top Stuffing commercials where the man dresses as a Pilgrim. (Sadly, I can’t find any of them on YouTube anymore, so you’ll just have to see them next Thanksgiving if they show them again.) Those always crack me up! Today, we’re filming the actor who plays the attorney as a small child, and tomorrow, we’ll be filming the attorney in court. Though due to the Florida Bar regulations, we’re not actually allowed to film him in a real courtroom. As such, we had to rent out the old courthouse museum, and stage a courtroom there. The courtroom we’ll be using was built in 1908, and it looks very much like the one in the movie version of “To Kill a Mockingbird.” In fact, the last couple of times we were there to inspect just how we’d have to set things up to film, I could swear I heard Gregory Peck whispering to me in the distance. I’ll be sure to take photos so I can show you the real thing soon. Time to talk: Do certain TV commercials grab your attention more than others? When you realize some commercials are part of a series, do you look forward to the next installment? The town where I live, the town where I was born, is Lakeland, and it’s named for its many lakes. In fact, our city’s symbol is the swan. When I was a kid, I loved to go to one of our many lakes and feed the ducks. I loved the ducks… the swans, not so much! Swans are huge and aggressive, they hiss like dogs, and they bite! And believe it or not, they do have teeth. By the time I was a teenager, feeding the ducks was a thing of the past because it was lame. Only the very young and the very old could appreciate feeding a bunch of birds. Anyway, the last time I fed the ducks, a handsome, grey goose wandered up to me to beg for some food. The funny thing was, after I fed him, he stuck around and “posed” until I took his picture. After that, he obviously wanted to check the camera and see how his portrait turned out. Time to talk: Have you ever gone to a lake for no other reason but to feed birds? Have you ever had a wild animal latch onto you and try to be your new best friend? I heard something so profound today that I had to share it. Where I work we had a White Dove releasing ceremony this morning for National Crime Victims’ Rights Week. 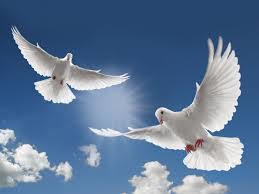 The released doves represented and honored the victims we serve. The man who owns the doves told us that when he first began this work, when he saw the baby doves showing signs of hatching, he would often help them by ever so gently cracking open the egg-shell. The next day, those assisted doves died. What he discovered is a lesson for living–and succeeding in–life. He said that in order for the baby doves to survive, it’s necessary for them to go through the struggle and the work of pecking away at the egg in order to strengthen their muscles, particularly their neck muscles, to survive once outside the egg. I apologize in advance if this offends anyone, but it cracked me up. Have an excellent weekend, friends!